The tale as old as time… Long ago in a small French kingdom, a disguised enchantress transforms a selfish prince into a hideous beast. He has limited time to learn to love – and be loved – by the tempestuous and headstrong, Belle. The Disney musical stage adaptation includes all the beloved inanimate objects: Lumiere, Cogsworth, Mrs. Potts, Chip, et al, and the iconic Alan Menken/Howard Ashman score includes Be Our Guest, Beauty and the Beast, Gaston, Home, Belle and many more. 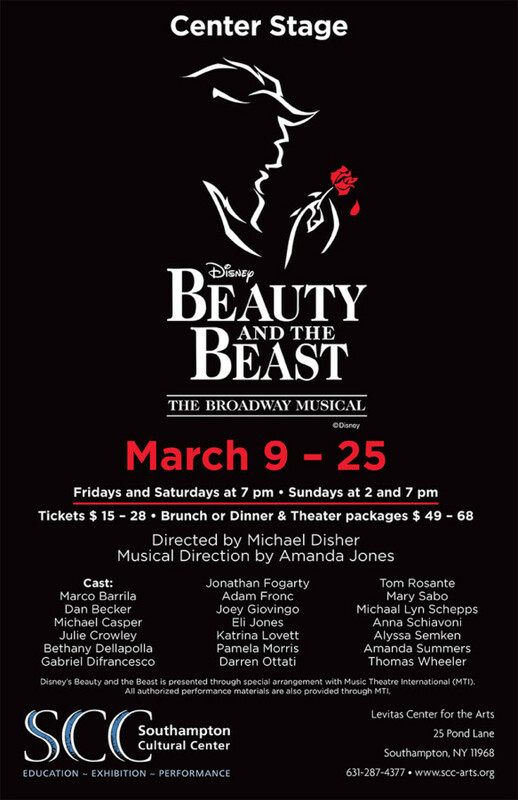 Beauty and the Beast features Marco Barrila, Daniel Becker, Michael Casper, Julie Crowley, Bethany Dellapolla, Gabriel DiFrancesco, Jonathan Fogarty, Adam Fronc, Joey Giovingo, Eli Jones, Katrina Lovett, Pamela Morris, Tom Rosante, Michaal Lyn Schepps, Anna Schiavoni, Alyssa Semken, Amanda Summers and Darren Ottati as The Beast and Mary Sabo as Belle. Dinner/Theater Package: $68 adults, $58 students. Includes 3 course dinner, tax, gratuity and a ticket to the show. Dinner location: The Plaza Cafe (631-283-9323), located at 61 Hill St, Southampton, NY 11968. We offer the packages on Fridays and Saturdays. After purchasing your package, please call the restaurant to make a reservation. Brunch/Theater Package: $56 adults, $37 students under 21. Includes brunch, a drink, coffee and dessert, gratuity and admission to show. Available on Sundays. Brunch location: Edgewater Restaurant (​631-723-2323), located at 295 E Montauk Hwy, Hampton Bays, NY 11946. After purchasing your package, please call the restaurant to make a reservation. Overnight Package: Overnight Guest Room + Two Tickets to Beauty and the Beast for $200 (plus tax). Overnight Guest Room + One Ticket to Beauty & the Beast for $175 (plus tax). Offered in partnership with Southampton Inn. Please call 631.283.6500 to purchase this package. Group Packages: Groups of 10 and up $20 for adults; $10 for children. Please call or email us to purchase a group package.